After cancelling my soup plans last week, I finally got to make and have my soup today! And that means I got home early enough to play around in the kitchen. Maybe this week will be ok after all. Fingers crossed! Anyway, my soup idea hit me when I was grocery shopping last week. There were four different varieties of squash to choose from, and I decided to go with the butternut kind. Then that poor squash just sat in my fridge…until today that is. And then about half way through the prep process, another idea hit me, so I started going through my spice cabinet. I pulled out some ginger powder, cumin and coriander powder, and red chili powder. I wanted to turn a simple butternut squash soup into an Indian inspired one. Melt Earth Balance in a large pot over medium high heat. Add garlic and cook for 2-3 minutes. Add onions and cook until soft and translucent (5-6 minutes). Add squash and vegetable stock. Bring liquid to a simmer and cook until squash is soft (15 minutes). 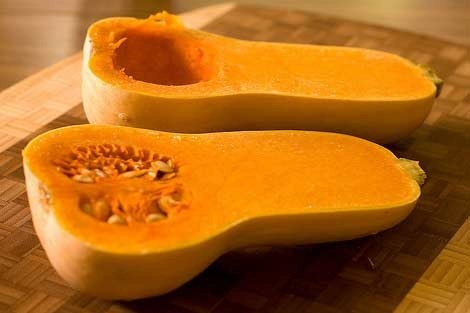 Remove as many of the squash and onion pieces with a slotted spoon and puree in a blender until smooth. Add the pureed squash mixture back to the pot and stir until combined. Add salt and spices and stir until combined. This soup is slightly spicy and has a hint of Indian”ness” to it. I think an Indian inspired grilled cheese (mint chutney, soft cheese, and tomatoes) would pair well with this soup. YUM! Next foodie mission: put a creative spin on the brussels sprouts sitting in my fridge. Are you a squash lover? What’s your favorite kind? Butternut squash is my absolute favorite- love it and this recipe! An idea for your brussell sprouts: shallots, cumin and a hint of maple syrup! Or even straight up roasted with ketchup is yum!